Bestselling, award-winning novelist Elizabeth Berg knows a thing or two about writing, having graced the world with wonderful works of fiction including Talk Before Sleep, The Year of Pleasures, and the acclaimed Oprah Book Club Selection, Open House. With Escaping Into the Open, she offers an inspiring, eminently entertaining, and delightfully practical handbook on the joys, challenges, and creative possibilities inherent in the writing life. 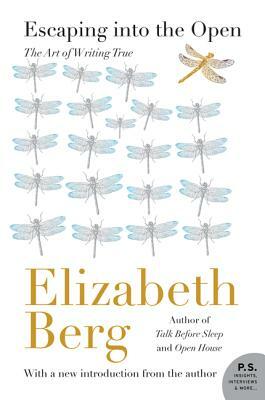 Now revised with new material—a classic in the vein of Writing Down the Bones by Natalie Goldberg and Anne Lamott’s Bird by Bird—Elizabeth Berg’s Escaping Into the Open is an indispensable guide for any aspiring storyteller. Elizabeth Berg's work has won the NEBA Award for fiction and has been included twice on the ALA Best Books of the Year list. Her novel Open House was an Oprah's Book Club pick, and her writing has appeared in numerous publications, including Ladies' Home Journal, Redbook, and the New York Times Magazine. She lives outside Chicago, Illinois.